Heat oven to 400°F. Spray 15x10x1-inch pan with cooking spray. In pan, spread corn in single layer. Spray corn generously with cooking spray. Bake about 20 minutes, stirring after 10 minutes, until lightly browned. Spray 3 1/2- to 4-quart slow cooker with cooking spray. In cooker, mix roasted corn and remaining ingredients except sour cream. Cover; cook on Low heat setting 7 to 9 hours. Top each serving with dollop of sour cream. 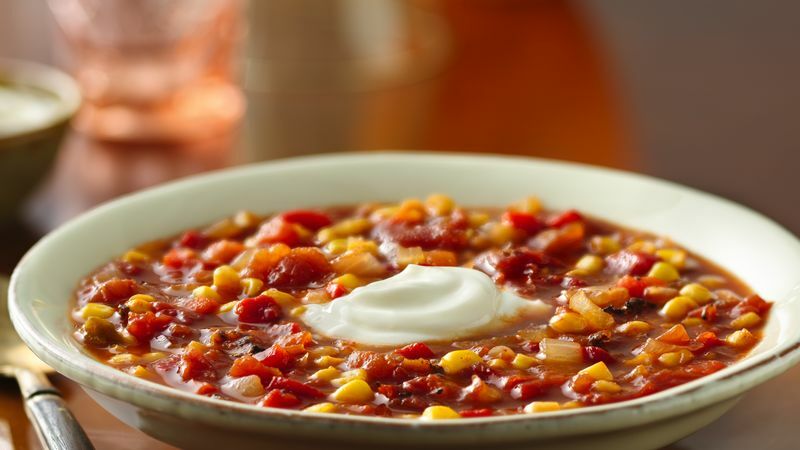 If a spicier soup is preferred, stir in 1/8 to 1/4 teaspoon crushed red pepper flakes along with seasonings. Cook as directed. If desired, serve each bowl of soup with a dollop of reduced-fat sour cream or sprinkle with shredded Monterey Jack cheese. If desired, add 1 or 2 carrots, chopped, to the soup and cook as directed. Corn can be roasted and stored in the refrigerator for up to 2 days before making soup.